Colin Luther Powell is an American Statesman and a four-star retired general in the U.S. Army. Colin was the 65th U.S. Secretary of State, where he served under President George W. Bush between 2001 and 2005. He was the very first African American to serve in such a position. During his time in the military, he served as the National Security Advisor, Chairman of Joint Chiefs of Staff and as Commander of U.S Army Forces Command. Colin was born on April 5th, 1937 in Harlem, New York. His parents were Jamaican immigrants. Colin was raised in South Bronx. He joined Morris High School and graduated in the year 1954. While still in school, he used to work at one of the local baby furniture stores. In 1958, he received a Bachelor of Science degree in geology from City College of New York. Later, he earned a Master of Business Administration degree from George Washington University in 1971 after touring Vietnam. Colin Powell served in a tour in the Vietnam War as South Vietnamese Army advisor from 1962 to 1963. One day, while in patrol in a Viet Cong-held area, Colin stepped on a punji stake and this wounded him. A resulting infection made it very difficult for Colin to walk; his foot was swollen for a while and this shortened his first tour. In 1968, he returned to Vietnam. During his second tour in the Vietnam, he was praised for being very brave; this was after he managed to survive a helicopter crash and also rescue three other men all by himself. In the early 1980’s, Powell served in Fort Carson, Colorado. Just after leaving Fort Carson, he became a senior military assistant to the Secretary of Defense Caspar Weinberger. He assisted Weinberger during a 1983 invasion of Grenada and also in a 1986 air strike on Libya. In 1986, Colin took over command of the V-Corps in Frankfurt, Germany. At 49, after the Iran-Contra scandal, Colin became Ronald Reagan’s National Security Advisor. He served between 1987 and 1989 while still retaining his Army commission as the lieutenant general. In 1989, he was promoted to being a full general while under the then U.S. President George Bush. He only became the 3rd general since the Second World War joining Alexander Haig and Dwight Eisenhower, to reach 4-star rank without even serving as division commander. Later in 1989, President George Bush selected Colin as chairman of Joint Chiefs of Staff. His last military assignment was between October 1st, 1989 and September 30th, 1993. He served as 12th Chairman of Joints Chiefs of Staff; this is the highest position in Department of Defense. 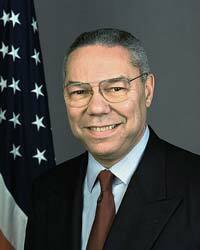 Colin Powell’s experience in the military made him a very popular figure in American politics. Many Republicans saw Colin as a very great asset. In the 2000 U.S presidential race he campaigned for George W. Bush. After Bush won the election he was appointed the Secretary of State. As a Secretary of State, he was described as a moderate. After retiring from his role as a Secretary of State, he returned to his private life. Colin Powell married his wife Alma Johnson on August 25th, 1962. Colin and his wife have one son and two daughters.